Cottage in the heart of the landing beaches near the German battery near the sea. In an old family farmhouse partially destroyed during the landing of 1944, you will stay in the old part quiet of a large private garden and enclosed, south facing terrace pergola and fruit trees. 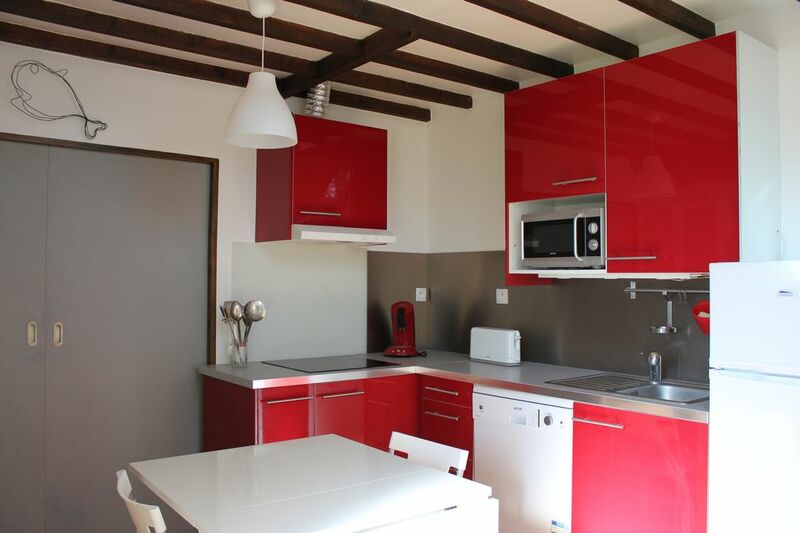 Housing renovated, including a fitted fully equipped kitchen (dishwasher, electric oven, microwave, toaster, Senseo coffee machine, kettle, induction hob, fridge with freezer compartment. A large bedroom with a double bed and an alcove with a trundle bed (2 mattresses of a person who makes a great bed). A bathroom with shower and two separate toilets. Beautiful cottage. Very clean en calm. Nice garden. Le gite est parfait pour passer une semaine ou un week-end de repos. Tout a été refait dernièrement et le gite est très fonctionnel. La propriétaire est très arrangeante et répond très vite. Je recommande très fortement cette adresse.